Sir Alex Ferguson says Manchester United are considering a transfer raid on Juventus following the Italian club's relegation from Serie A. The Turin side were demoted as a result of their part in Italy's match-fixing scandal, and it seems certain that many of their top players will leave. "We held things back until we knew what the Juve situation was," said Ferguson. "Now we know where we're going in terms of making inquiries and maybe definite offers for one or two players." 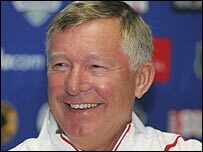 Ferguson said Gianluigi Buffon, Gianluca Zambrotta, Fabio Cannavaro, Lilian Thuram, Emerson and Patrick Vieira were "the ones that people will be focusing on", adding that one or two "could maybe have free transfers if they were going outside of Italy". Meanwhile, Ferguson said that striker Ruud van Nistelrooy would not be leaving Old Trafford in a cut-price deal. The Dutch player was left out of the United first team for most of the second half of last season and has been heavily linked with a move to Real Madrid. "There's a possibility that Ruud will go," said Ferguson. "There have been bits of interest in him, but no one at this moment has reached our asking price. "It's no surprise, really, that he asked to go, but when you see that Andriy Shevchenko went for £30m, he's a similar age to Ruud and their record in Europe is almost identical. "You can absolutely guarantee that we're not going to give Ruud away."